Please see the course calendar here. How, and when, should I book? To book a place on one of these courses, please log onto My EBU. and select the Book Courses option from the Utilities tab or contact Richard Banbury on 01296 317218. Payment is required at the time of booking. The cost of this course is heavily subsidised, and is currently £60. EBU Members qualify for a 10% discount. What if I need to cancel or change a booking? Numbers matter — if you are unable to attend a course for which you have registered, please advise EBED in advance rather than simply not turning up at the venue. Course tutors are booked directly in line with expected attendance. We are always sympathetic to a change in circumstances, but cancellations should be made at least two weeks prior to the course to avoid forfeiture of your entry fee. How much does it cost ? What about concessionary rates? EBU Members will enjoy a discount of 10% from the standard pricing. Bookings may be made by clubs, or directly by individuals. For all Club director training courses other than those mentioned above, the following fee structure applies. When will I hear about the arrangements for the day of the course? You will receive detailed information by email on the course and pre-course materials approximately ten days before the course is due to take place. On occasions, we may need to contact you via telephone. Please take a moment to ensure that when you are booked on a course that your member’s details accessible via the EBU website are complete and up-to-date – otherwise we may not be able to get hold of you if there is a late change. 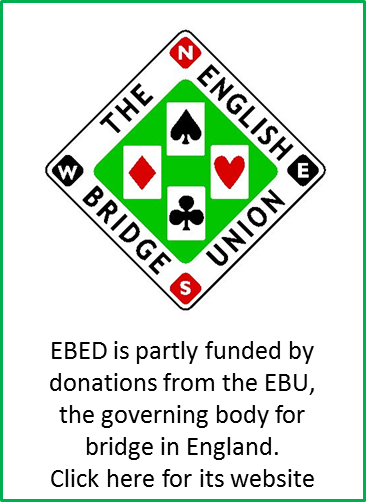 In addition to a pen, delegates should come to courses equipped with a copy of the Laws of Duplicate Bridge 2017 and the Handbook of EBU Permitted Understandings (Blue Book). NB The Red Book (Laws of Duplicate Bridge 2007) has ceased to be valid. Will I get something to eat at the course? Coffee and tea are provided but delegates should bring their own lunch. Any changes to this arrangement will be notified to you in the pre-course letter. How long is the course and when does it start? How do I contact the course tutor? Information on how to contact the course tutor is included in the letter which you will receive before the course. I can't get to the Assessment day; can I do the Assessment module online? Under exceptional circumstances, such as when a member is based abroad, it may be possible for this module to be completed by mail. When will I get the results of my Assessment Course and certificate? Top line results of the course can be notified to you upon request shortly after the course tutor sends us the results. Production of certificates may take a while longer, but we endeavour to send them out within one month from the end of the course. Can you organise a course at my club? If your club would interested in hosting a suite of courses, in the first instance it may be worth speaking to your county secretary to assess the demand from other clubs in your area. NB half- or 1-day courses can also be organised as refreshers on specific topics - in addition to the Club director training Course. For more information contact Richard Banbury at English Bridge Education & Development by email or on 01296 317218 for further details on setting up a course at your club.